Technozym® vWF:CBA Collagen I ELISA is a research assay kit for determination of von Willebrand Factor (vWF) collagen binding activity (CBA) with collagen Typ I coated plates. 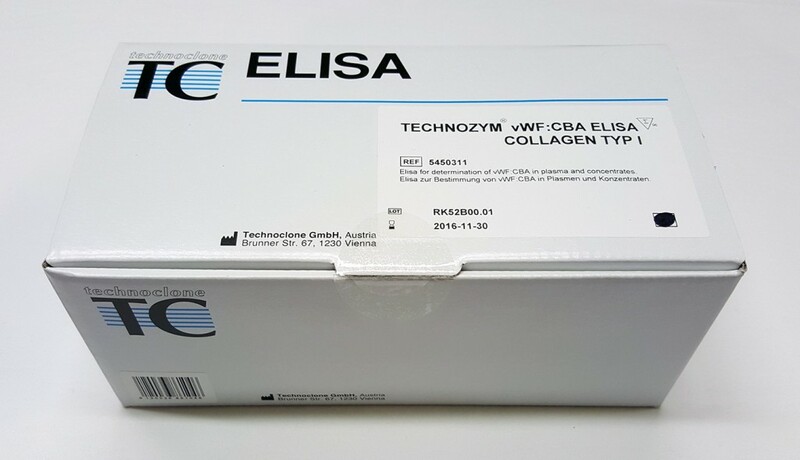 ELISA test strips: (12) with 8 wells each, coated with human collagen Typ I; the drying agent is supplied in an aluminium bag. Washing buffer concentrate: (PBS; pH 7.3); containing detergent; 0.01% merthiolate; 1 bottle, 80 ml. Incubation buffer: (PBS; pH 7.3); contains stabilizer protein; 0.05% proclin; and dye 1 bottle, 90 ml, ready for use. Calibrators: (Standards) numbered; lyophilized; 1 bottle each. Concentrations are lot-dependent; consult label on the vial. Control plasmas: “low level” and “high level” for checking purposes, lyophilized; 1 bottle each. Concentrations are lot-dependent; consult the label on the vial. Conjugate: polyclonal Anti-vWF-POX; dyed blue; 1 bottle, 0.3 ml. Chromogen TMB: (tetramethylbenzidine); 1 bottle, 12 ml; ready to use. Stopping solution: sulphuric acid 0.45 mol/l; 1 bottle 12 ml; ready for use. Adhesive film: for ELISA test strips (2). It is the carrier protein for Factor VIII in plasma; it forms a complex and thus protects Factor VIII from early proteolytic decomposition. It acts as a mediator for platelet aggregation by attaching itself to platelet membrane receptors (GP Ib and GP lIb/IIIa) following previous platelet activation. It plays a part in primary hemostasis by acting as a mediator between adhesioned platelets and the subendothelium (lesioned vascular wall). In order to analyze the adhesive properties, as a rule the platelet aggregation is measured (measuring system = ristocetin-dependent platelet aggregation). However, this does not reflect the physiological setting nor the function of the vWF. For determining the adhesive properties of the vWF, its binding capacity to collagen serves as a parameter which corresponds to the physiological function of the vWF.